I’m Harkirat Singh from Northampton and I attend Sikh camps and workshops all over the world. Please check out the Sikh Education Service. A. I was blessed to progress my accountancy into an International Tax Specialist, and then at the age of 35, having had multiple health challenges, took the advantage of a year out, learning to be a better child, brother, friend and husband. Blessed to become a father, this was perfect timing as always in Guru Sahibs masterplan. A. Seva Kaur, our daughter, has since grown into mature 12 year old; time does not stand still. Q. You have been attending Sikhi Camps up and down the country for many years now, what can you share from your experiences? A. In those 12 years, being in sangat has enabled us all to continue learning and sharing with like-minded parents and otherwise. Travelling to Sikhi and Gurmat Camps has allowed us to focus our time and daswandh on Sikh Education Seva, and meet many inspirational souls from all backgrounds, young and old. Q. You offer Sikh education assemblies and workshops across UK schools, how did this come about and what stage would you say you’re at? A. What was an Ardas for a year out of a full-time profession, became an extended Ardas to continue on the path that had been discovered. The Northampton Sangat had space for an education and museum space in the local Gurdwara, and schools wanted to visit. They starting coming, I started hosting, and by the end of the year, 1000’s of school children had visited. The next year school budgets dropped (they couldn’t afford the coach costs), so I offered to visit them in schools, another journey began, with what was for Northamptonshire Schools, soon led to Religious Education Teachers wanting staff training, soon led to spreading to neighbouring counties and beyond. A. My biggest influence has to be Guru Nanak Dev Ji, and their journeys and lessons are my inspiration. They inspired many many others and continue to do so; this list would be endless, as I have travelled far across the world, and continue to meet these flames of ignition in many walks of life. A. Remain in Gratitude, helps you in accepting Hukam. A. My father died when I was a teenager; he said something very special to the effect of;“Not even your mother, chacha, family etc may stop to ask you read Rehras in the evening together. Remember those pyare who do encourage you to do so. My friends who ask you to do this are the ones to keep making time for”. A. Advice for someone being a dad for the first time is understanding Munn, Thunn, Dhaan; as you have been given a very big Seva now. A. My child has taught me that I can learn from her, and to humbly do so, inspires her to help others learn. A. I would encourage all parents to be to start the Sikhi journey now, and keep taking tiny steps forward; take leaps when you want to, but do that together as a family and not because of other influences. A. As I am completing this interview, I am thinking that further questions/conversations like this (with one’s own mind) is what would be useful. Maybe somebody creative reading this will be inspired to create a solution that fits. A. Anybody who wishes to meet up without judgement and not to slander anyone during the conversation, and who is willing to pay the bill! A. 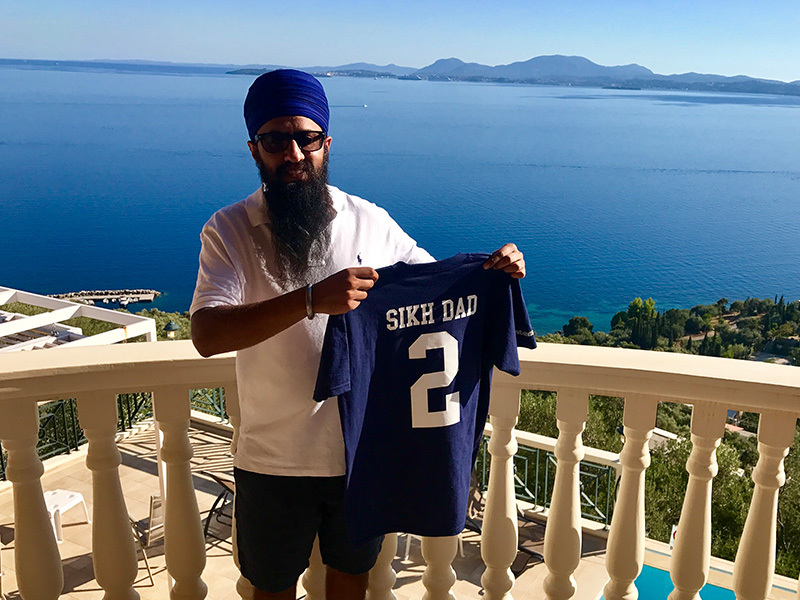 At a Sikhi Camp in Scotland, children were swinging across a deep muddy pond of water ; one got stuck at the last ring ; I went to help slightly over-dressed as I had a neck injury, slipped en-route running around the pond, only to get to him on time, grab him, but then to fall in with him. My daughter will never let me forget! A. Most rewarding experience as a father has been to listen to my daughter offering to help others. A. The biggest for me is the control of my anger. The challenge continues every day for someone whom it was a habit. A. Remain a cool one; you are blessed with this opportunity. I first met bhaji Harkirat Singh at a Sikhi camp close to our house in South East London, when I spoke with him I was shocked that he had come all that way with his family for our small local camp. I then started seeing him in more places and realised the effort and lengths that he would go to in order to expose his family to the Gurus sangat nationwide. He is very friendly and easy to talk to, someone I admire and would not hesitate to contact when I am in need of any advice. You may be wondering why unlike my past interviews there are no images? We are going to try something different this month so watch out for some video footage on the Sikh dad channels over the next few days, to explain and bring to life some of the answers, I promise you won’t be disappointed with what is to come! Lastly, I would like to thank Harkirat Singh for taking his time out for Sikh Dad.